Laureth Peak's father has taught her to look for recurring events, patterns, and numbers--a skill at which she's remarkably talented. Her secret: She is blind. But when her father goes missing, Laureth and her 7-year-old brother Benjamin are thrust into a mystery that takes them to New York City where surviving will take all her skill at spotting the amazing, shocking, and sometimes dangerous connections in a world full of darkness. She Is Not Invisible is an intricate puzzle of a novel that sheds a light on the delicate ties that bind people to each other. Although I’m new to Marcus Sedgwick’s work, I took one look at his previous ratings and award nominations and rushed to download She Is Not Invisible, confident I would enjoy it. It is, indeed, obvious that Sedgwick is an author of great talent – in this book, his sentences appear to be liquid, blending together effortlessly in a prose piece of extraordinary beauty. But sometimes, even that isn’t enough. This is not Sedgwick’s first book written from a teen girl’s perspective. There is The Foreshadowing, for one, and possibly even others. But I’d venture to say that he knows very little about 16-year-old girls, since there was nothing about Laureth’s voice that struck me as particularly authentic. I’ve never read a YA book with a blind protagonist, which is a pity, but Laureth’s double standards bothered me immensely. On the one hand, she tried very hard not to let anyone notice she was blind. She hid it right up until someone backed her into a corner and forced her to admit it. On the other hand, she would get offended and upset when people treated her like she wasn’t blind – for example, when people she ran into (while pretending not to be blind) dared to complain. She Is Not Invisible is a clear example of an author trying too hard: to be original, occasionally funny and true to life, and through it all, to deliver those Very Important Messages we all seem to need. Somehow, in this grand effort, simpler and more important things were neglected and lost: things like substance and plausibility. The already short narrative was burdened with a long, tedious study of coincidence, which was the reason behind the disappearance of Laureth’s father. Instead of being clever, excerpts from his little notebook (that served as Laureth’s guide), were very disruptive to the plot and, to be blunt, incredibly boring. But most of all, I find it hard to believe that a 16-year-old blind girl would be able to travel unnoticed from London to New York with a 7-year-old boy in tow. The idea that US customs would neglect to check her documents because they were otherwise distracted is slightly ludicrous. I have no trouble suspending disbelief when I know that’s what’s expected of me, but in a book that strives to be realistic, details like that are very out of place. 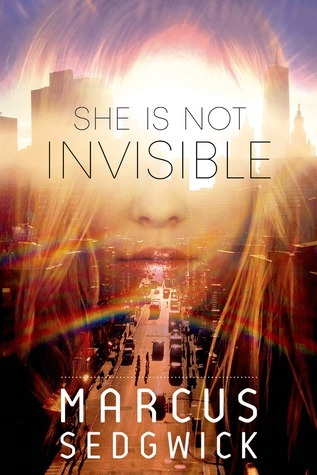 Overall, She Is Not Invisible is not a book I’d recommend, despite the gorgeous writing. The story is poorly planned and plotted and its protagonist completely unmemorable. I have always been a bit hesitant about this book, for exactly the reason you mentioned here - plausibility. The synopsis raised a red flag instantly when it talked about how a blind 16-year-old is able to travel with her 6-year-old brother to a totally strange city, plus the fact that she is actually blind. It is very hard for me to believe that can ever happen, which will for sure bug me throughout. I will probably skip this one. Awesome review Maja! Sorry you didn't like this one. It does sound quite unbelievable in a lot of ways. It's great that the MC is blind, but I think I'd rather read another book with a blind protagonist that deals with it better. Aww :( I have seen some mixed reactions towards She Is Not Invisible and it's a shame because I really love the concept (blind protag!!) and now am torn about whether or not it's worth reading. It'll probably have to stay in my TBR for now. Gorgeous writing is all well and good but if there's not a strong story behind it, it just doesn't work. I saw the premise of this one and have read some reviews (very mixed, actually) but I was thinking it seemed kind of unbelievable. Not that the girl couldn't do it but the missing documents, no one looking for them or seeing them, really, just seems over the top. It's a shame you didn't enjoy this one, Maja, as I've been meaning to pick up a novel by Sedgewick and was hoping to start with this. You've brought up excellent points, though, that other reviewers have neglected so it looks like I'll be trying out Midwinter Blood instead. Thanks for such an honest and helpful review, dear! I've never read anything by this author before (though I do have a different book on my wishlist), and I have to admit . . . this one does not sound great. When authors over-shoot whatever it is they're trying to accomplish, I just get bored. AND if I don't find the story plausible, I might as well not even bother . . . I am a bit on the fence about this one, cause it sounds great and it's a contemporary that is not about romance, but when a book is full of convenient excuses to make things advance... I've been to the US three times and there is no way immigration would be distracted to fail to check your papers and not take your photo and all your fingerprints, some of them twice!! Thanks for the very honest review, Maja! Yeah even though the writing was nice this was just overall and really strange read with no real conclusion, or at least not one I loved. Great review Maja!! I have missed you, how are you? yeah I keep hearing that the story was poorly done, that's a shame really. Ahh too bad, I adore gorgeous writing, but I have yet to read a great review on this one. I am skipping it. Glad to have you back. Hope everything is okay in your world. So she isn't completely blind, only legally? I don't think I would like her double standard either. Na, don't think this one is for me. It is sad because I could see such potential! Aw, it's a shame that this book suffers from plausibility issues. Considering how tight airport security is these days, I too find it hard to imagine customs being distracted enough to let a sixteen year old travel unnoticed with a younger child. I thought this one sounded interesting, especially because the MC is blind, but will be skipping it now. Such a shame, I really liked the premise, but know that I would struggle with the issues you presented. Great review Maja. I'm yet to read anything by Marcus, though I do own one of his books, and I see some really positive reviews of his work. I think I'd have the same issues with the plausibility of the plot, things like that always impede my enjoyment of a story. Wow. Thanks for the review! I read the description and it sounded pretty good, but thanks for the warning. I don't like when the characters are hard to connect with or when it seems like they are not developed well.